This will be an epic sales week on Accelerate! This is our 2nd Annual Sales Kick-off Week. And I’ve lined up a series of powerhouse guests that are going to deliver massive value to help you crush it in 2017. If you’re not already making Accelerate! your go-to source for the best sales advice you can find online, then this week will be the perfect opportunity to start! You can find Accelerate! in many places. Click here to listen to it from andypaul.com. Click here to listen to Accelerate on iTunes. Click here to listen to Accelerate! on SoundCloud. Here’s the line-up of what you’re going to learn this week. Don’t miss any of it! What You’ll Learn: How You Can Increase Sales Through Customer Service. Guest Expert: Peter Shankman. We’re kicking-off our Kick-off with Peter Shankman, who is one of the most sought after keynote speakers on customer service and social economies. He is the founder of HARO, founder and CEO of the Geek Factory, a digital agency based in NYC, founder of Shankminds, an online community for entrepreneurs, author of multiple books including Zombie Loyalists: Using Great Service to Create Rabid Fans, and he is the host of the Faster Than Normal Podcast which embraces the concept that having ADD or ADHD is a gift, not a curse. What You’ll Learn: How You Can Stay Focused and Productive When You’re Crazy Busy. Guest Expert: Jill Konrath. If you’re in sales you know who Jill is. She’s an incredible speaker and the author of multiple best-selling books including Selling to Big Companies, SNAP Selling, Agile Selling)and her latest book: More Sales, Less Time. What You’ll Learn: How You Can Quickly Engage and Connect with Your Buyers. Guest Expert: Jim Keenan. Known to friends as Keenan, Jim is The Sales Guy. He is a motivational speaker, coach, recruiter, blogger and author of the best-selling book: Not Taught: What It Takes to be Successful in the 21st Century that Nobody’s Teaching You. What You’ll Learn: How You Can Grab the Attention of Busy, Distracted Buyers. Guest Expert: Jill Rowley. Jill is a Digital Transformation Specialist who understands how to use social as well, if not better, than anybody. She has worked with Salesforce,com, and lead the social selling efforts at Eloqua and Oracle. She’s a dynamic speaker, and leading Social Selling Evangelist. What You’ll Learn: How You Can Use Stories and Content to Connect with Your Buyers. Guest Expert: David Meerman Scott. David is a leading sales and marketing speaker and author of numerous best-selling books including The New Rules of Marketing & PR (with over 350,000 copies in print in 25 languages), Newsjacking, and more recently The New Rules of Sales & Service: How to use Agile Selling, Real-time Customer Engagement, Big Data, Content and Storytelling to Grow your Business. What You’ll Learn: How You Can Accelerate Your Success in 2017. Guest Expert: Mark Hunter. Mark Hunter is The Sales Hunter (the best name in Sales!) Mark is one of the leading keynote speakers on Sales, a prolific blogger and the author of two great books: High-Profit Selling: Win the Sale Without Compromising on Price and High-Profit Prospecting: Powerful Strategies to Find the Best Leads and Drive Breakthrough Sales Results. 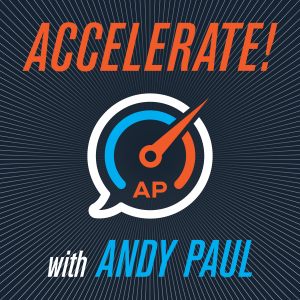 Please make sure to share Accelerate! with your colleagues and friends. Good selling everyone!